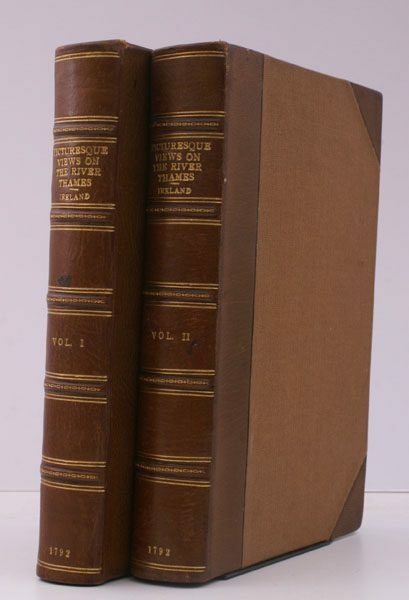 2 vols., 8vo., First Edition, Large Paper, with engraved pictorial titles, printed titles, 53 fine sepia aquatint plates, 21 woodcut illustrations in the text and 2 full-page maps, mild dust-soiling at blank margins, some offsetting from plates to facing pages; attractively bound in early twentieth century crushed brown half morocco, brown cloth boards, back with five raised bands tooled in gilt, second and fourth compartments lettered and numbered in gilt, all other compartments ruled in gilt, a bright, firm copy. With half-titles, and errata leaf at end of each volume. The aquatint titles and plates are engraved by C. Apostool after Ireland. LARGE PAPER COPIES ARE SCARCE. Abbey: Scenery 430; Anderson, p. 38; Upcott CXLIII.